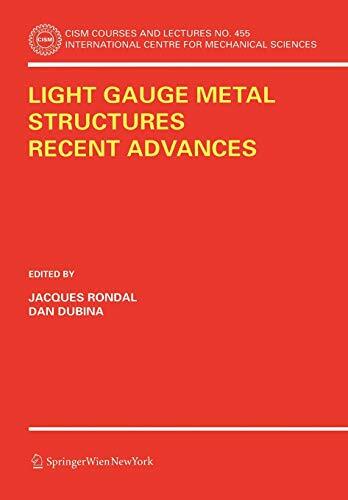 [PDF] Light Gauge Metal Structures Recent Advances (CISM International Centre for Mechanical Sciences) | Free eBooks Download - EBOOKEE! Description: The aim of this book is to review recent research and technical advances, including the progress in design codes, related to the engineering applications of light gauge metal sections made in carbon, high strength and stainless steel, as well as aluminium alloys. Included is a review of the new technologies for connections of light gauge metal members. Main advanced applications, for residential, non residential and industrial buildings and pallet rack systems are also covered. For the first time, this book takes into account all the metallic materials now used more and more for structural components. The book will be of great interest not only for researchers but also for design engineers faced to the use of new metallic materials in modern structural applications. No comments for "[PDF] Light Gauge Metal Structures Recent Advances (CISM International Centre for Mechanical Sciences)".